Matt and Djomba started reading together this year. 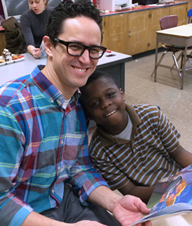 Matt Hooban, a Communications Associate at Hachette Book Group, has been volunteering with Read Ahead for three years. But his involvement goes far beyond the hour-per-week commitment of being a reading mentor. Matt serves as the company liaison between Hachette and Read Ahead, helping to organize and coordinate Hachette volunteers who read at PS 111. This holiday season, he also helped coordinate a donation of a thousand books from Hachette so that each Read Ahead student could receive a wrapped holiday present. What inspired you to start volunteering for Read Ahead? I work in the department at Hachette that coordinates the Read Ahead volunteers, so I had some direct involvement with actually helping plan and organize the program. It was immediately appealing to me—it comes from a lifelong love of reading and especially of sharing vocal reading because that’s one of the most meaningful parts of reading. What is the most rewarding part of volunteering with Read Ahead? For me, the most rewarding part is looking back at the end of the year and seeing how far the student has come and how deeply you’ve built that relationship. It’s also nice, in the day and age we live in, to bond over a book and not over an electronic device or a video game or something flashy. Touching a book and sharing a book, but also doing it socially, with another person is great. I’ve been fortunate enough to have worked with three different students through Read Ahead—it’s been really fun to watch their different journeys. What was your experience like with William, your student last year? William was very rambunctious and playful, so it was fun to develop a conversational rapport with him that we then transitioned into reading and books. The strategy with him was to find out what he enjoyed, to really become friends with him first. And Djomba, your student this year? Djomba has an obvious love of Dr. Seuss and it’s been really fun to get into that with him. Right now we’re exploring word play, so when we finish a book and don’t have time to start a new one, we’ll do activities like choosing a word and coming up with audacious rhymes—something that gets at that playful Dr. Seuss style of language. We recently read The Lorax together. He was really engaged with the story and thought about it more deeply than just the funny language or the pictures. We talked about what it meant and what it was a parable for—he really thought about the message. My father read to me and my siblings every night when we were young, both books and poetry, including Huckleberry Finn. He would get really into the dialects, picking up the different styles of language and the different accents. It was a performance as much as it was a book. The poetry was really fun because it was more lyrical, so we would have fun with different voices and it became very playful.